How the Grinch Stole Cookies… er. Christmas. 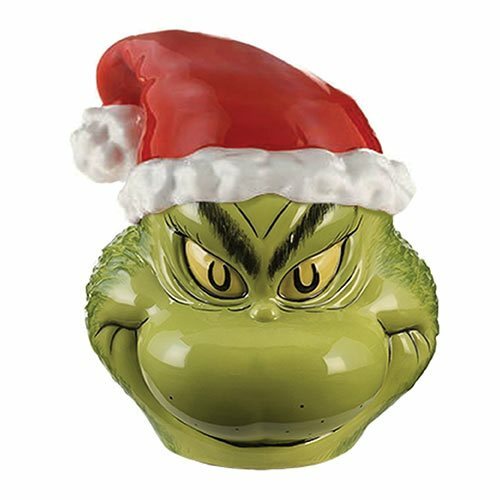 If you really want to trust this ill-tempered scoundrel to watch over your sweets, the Dr. Seuss Grinch Sculpted Ceramic Cookie Jar is for you! This one-of-a-kind container features a unique custom-sculpted design, a silicon freshness seal, and the Grinch's Santa-hat-adorned head in exquisite hand-painted detail. It measures approximately 12-inches tall x 9-inches in diameter and comes in a full-color gift box. Don't say we didn't warn you!